A friend of mine, knowing I sell dog crates, sent me this picture. It brought to mind the thought I hear from time to time and that is “a dog crate is like jail” for my dog. Nothing could be further from the truth. Dog parents who over use the crate to house their dog, even when at home, may have created a “jail” environment. This is something that none of us want for our pets. There are many reasons to provide your dog with his or her very own dog crate. If you have a dog with separation anxiety or a dog that is a “chewer” the dog crate is a way to improve quality of life for you, your dog and your family. Many dogs are just fine when the family is out of the home all day. Many dogs are not. These are the dogs that will tear up-chew up-rip up-mess up anything they can. Even more important these are the dogs that will eat anything while the family is gone. These are the dogs that appreciate their dog crate, their den, where they can rest and wait in safety and security until the family returns from their day out of the home. If you don’t already own a dog crate then save yourself some money, save yourself some grief, do your dog a favor and get him or her their own crate. 36", 42" and 48" Strongest Dog Crates are Available for your Strong Dog. "The Last Dog Crate You Will Ever Need"
This really happens folks. 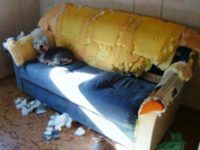 Whether it’s your new couch, your chairs or your drapes it can happen depending on the personality of your dog. Remember, A dog crate is not Jail! Oh dogs are so gorgeous, i wish i could have my extremely household of dogs. It would make my afternoon daily to see them have enjoyable. Hi Dog Boutique, Thanks so much for your comment. You know, that post was built around the picture. Normally I do a post based on content then go searching for a picture but with this one it was just the opposite. Checked out your site. You have it all going on there. I especially liked the dog tents. Thanks again and all the best to you and your 4 little ones. I got a good laugh from that picture. Probably because it wasn’t my couch. That poor dog was probably just bored. I just got a new puppy and before we left her alone we got her a pen. I didn’t want to confine her too much, so a pen was a good compromise. When we ae home we leave the gate open, and sometimes in the afternoon she will go in her pen and have a nap on her bed. We have 3 other dog beds around the house (we have 4 dogs), but she prefers her pen and knows it is her special space. My step-daughter has a chihuahua at her house, and I swear that dog has more clothing than I do! Sheesh! My dog only likes a sweater when it’s cold out. Oh, if I had a dog that did that to my sofa, I would be mad. Actually my Bichon did tear up the bottom of my ‘pleather’ couch trying to get her ball. Thankfully she hasn’t done it lately. But she does crate up for the night on her own. (We don’t even have the door on it anymore. Really sweet page you have there. Some of your posts really impressed me. I will definitely visit your blog again! Hi Jennifer, Thanks for your comment and yes, most dogs welcome their own place to rest or hide out if you will. It’s the “den” effect that’s still in their DNA. Personally I think that would be a great thing to have as a human. LOL All the best. .-= Bill Beavers Dog Crates´s last blog ..A Dog Crate is Not Jail =-. Fortunately our dog does not destroy anything but I think you are right because she does like to have a hiding place and a crate with some nice padding would probably work well for that. .-= Jennifer Bhala Hansen´s last blog ..Whole Life Insurance vs Social Security =-.